Blade length : 55.8 cm or 21.96 inches. Sori :1.5cm or 0.59 inches. Width at the hamachi :3.2 cm or 1.25 inches. 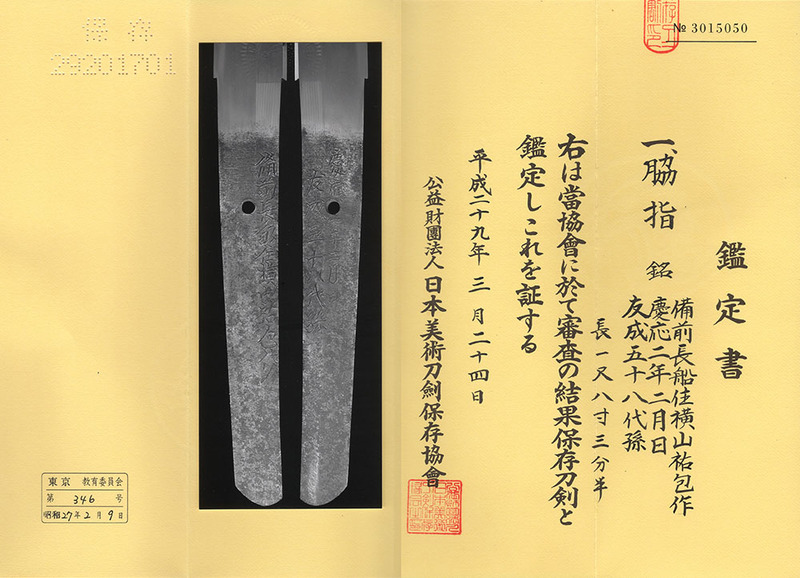 Width at the Kissaki :2.25 cm or 0.88 inches. Shape : Wide and thick, nice shape Wakizashi. Hamon : Nie Deki, Choji Miadre and Juka Choji Midare. There are many Ashi and Yo. Special feature:okoyama Sukekane was a swordsmith of Bizen province. He was an adopted son or a pupil of Yokoyama Sukenori. Tsuba : Round shape iron Tsuba, elephant and a person are engraved with gold color. Menuki : Shakudo, dragon is engraved with gold color. typical Choji-Ba. He is rated high since that time. tight Choji Midare and Fujimisaigyo. Sukekane descended from that. This blade is excellent. We recommend this wakizashi for you.